So you'd like to build all your own equipment, but you can't find anything in the books or magazines which fits your needs. Ever think of designing your own? Maybe you've entertained the idea, and decided it took a few engineering' degrees as well as a complete technical library and well-equipped test laboratory. If that's the situation, hitch up a chair, you've got a surprise coming. while!" and you know every bit of your gear came right out of your brain. If this feeling isn't enough, there's always a chance of making a buck. Wayne and the editors of the other radio magazines are always in need of good, original construction articles. So let's take a look at this business of rolling your own. To start with, what do you need? Jim Kyle K5JKX/6 1851 Stanford A/e. Sarta Susana, Ca i*. and elsewhere—aren't high-] mid engineers. Most of them are hams just like you. 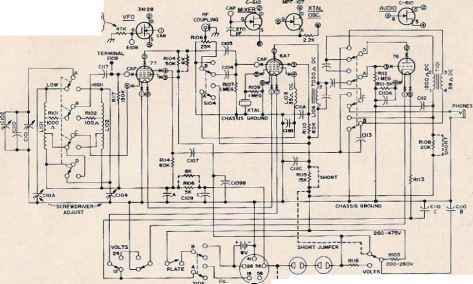 Designing any piece of radio equipment from a crystal set to a kilowatt sideband rig, is a simple process when you break it, down to fundamentals. And by doing it yourself, all the way, you'll get more out of hamming* There's a special feeling you get when the fellow at the other end tells you, "Best signal I've heard for a tion as there are amateur designers, but my answer is this: a ream of scratch paper, a dozen long, sharp pencils, a set of tube charts, and an inventory of your junk box. Sure, there are other things which will make it a little easier. If you have a good-sized technical library, or' drafting equipment, or a slide rule, and know how to use them, bring them along. But you don't really have to have them. The first step is to take pencil and paper and list the five basic things about the piece of gear you're going to design. You can unplug the soldering gun, incidentally, for this is a lengthy process—but its the most important step of all. These five basics are: Purpose, power, cost, size and features. They determine everything which follows. The purpose will help determine the power, and so will the cost. This is frequently a difficult item to decide on—it may help to remember that in case of transmitters, a kilowatt is only 10 decibels more powerful than a 100« watter, and only 20 db above a 10-watt rig. In S-units this figures out to less than 4 S-points—and band conditions in operation can easily make that difference smaller. Rear view of the rig shows control circuit connections and little-used controls. Knobs protruding through shielding are. from left, 6-rneter final tuning, 6-meter pi-net loading capacitor, and at right, MARS final tuning, MARS pi-net capacitor is trimmer set from under chassis, Plug at left connects to modulator and power supply. 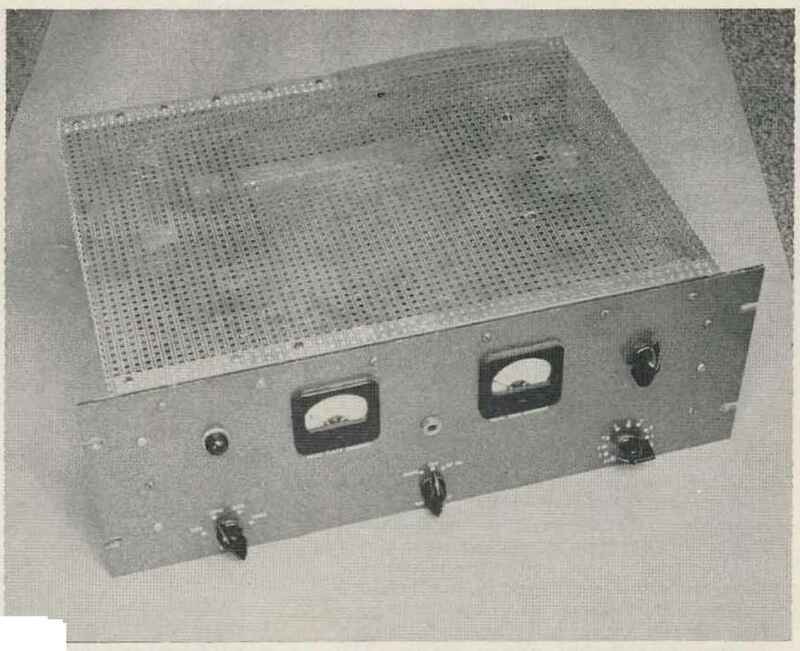 Phono ¡aclts at bottom are to receivers. Coax connectors are for antennas. Three AC sockets at right are receiver muting, top; control line (for accessories) and control switch, bottom, Beneath fuse plug is auxiliary 115-volt outlet for receiver, etc. Shield cover is normally buttoned down as at right; left was loosened for internal photos. Power sources also fall into this heading. There are three basic types: ac line, storage battery, and dry cells. Obviously no one will try to run a kilowatt from dry cells, but careful consideration of available power in relation to the power output you want is necessary in every case, After all, kilowatt-hours cost money, too, even if you're strictly in fixed operation. Cost is virtually self-explanatory, he junk box can help here, as can scrounging from fellow hams. But it's well to put down on paper exactly how much you're willing to spend on this piece of equipment. This helps in case you have to buy some special part to get the performance you want. And at this stage, nothing is definite yet. Host difficult of the basics to decide on is "features." This includes consideration of VFO or crystal control, VOX operation, differential keying, all the little "extras" which sometimes add to convenience of operation and sometimes are nothing but a nuisance. The sky's the limit, but it helps to take a few days and be certain you want what you want before you waste time going ahead. About here is a good place to give you an example from my own experience, showing how to list the basic items. Purpose of the unit was defined as: operation from 50-54 inc. and on spot frequency of 4,4175 mc. with enough power to give reliable communication at all times. Power was a question. Since I had a good supply of (51.4ti tubes, they were certain choice, At this stage, I chose to use two in the final stage for a nominal 100-watt power. Cost was simple, "As small as possible/' However, I was prepared to spend up to ?LG0 on the rig if necessary. Size, also, was to be as small as possible within reason. I had a seven-inch opening on my relay panel, and took a seven-inch relay panel as the target to shoot for. Features was the point where I went to town. 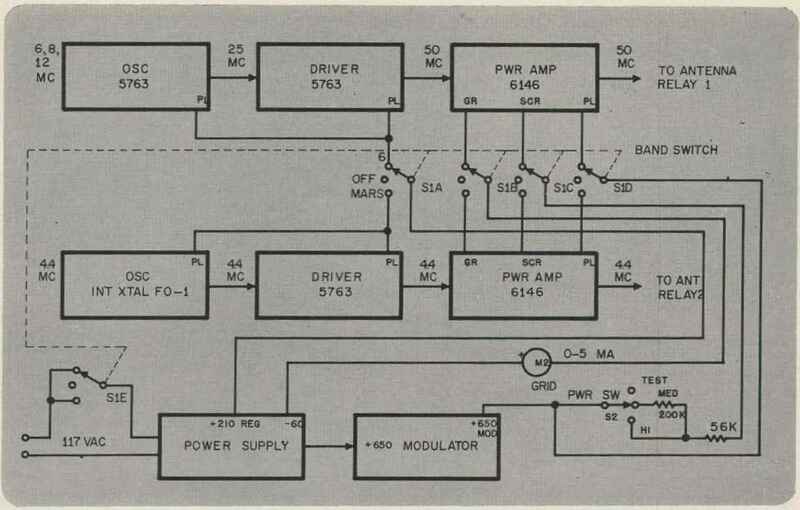 I chose first simplified controls with broadband tuned circuits. 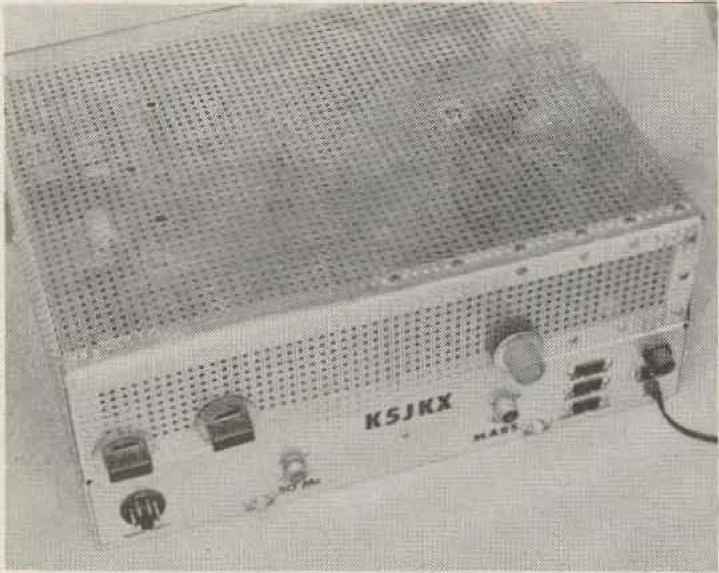 Bandswitching between MARS and VHF, Self-contained crystal bank. Power selection. Operation on phone only.